After that, a lot of other contributions followed, dealing with virtually every aspect of the bamboo rodbuilding process. Many of the contributors brought their rods, tools, gadgets, machines, materials, diagrams, designs and color slides to illustrate and explain their work and ideas to the others. I was really amazed about the willingness of these open-minded people to share their knowledge with others, -- something I sometimes miss in Germany. It is funny how time flies when you are having fun, so noone realized that we had been missing lunch! Not being masochists we had a _ hour break at about 3:00 p.m. to stretch the bones, go outside fo a walk and some oxygen. I used that break to learn more about the "Happy Hour" and how to correctly mix and enjoy a big, dry Vodka-Martini. After the break equipment and casting demonstrations followed, which had been an excellent occasion for having a closer look at the products of individual rodbuilders, asking questions and discussing. 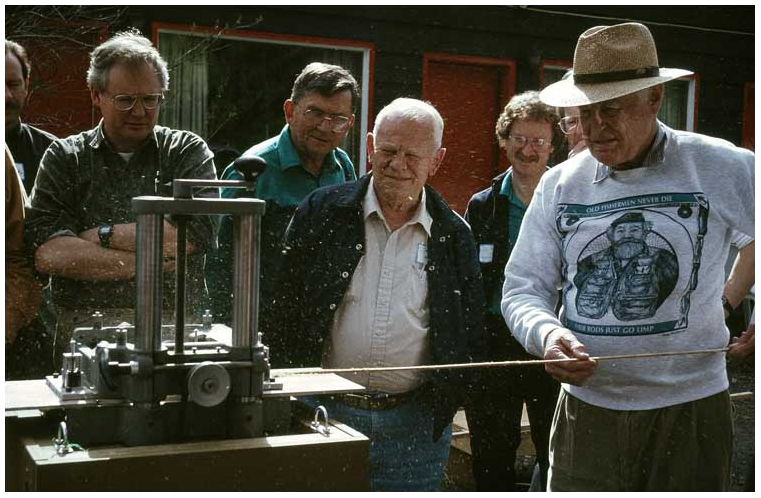 To name but a few rodbuilders and their contributions: Bob Milward of North Vancouver, B.C. 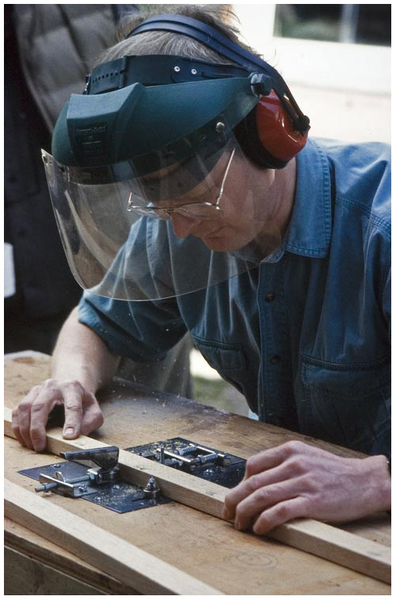 demonstrated his milling machine (see Planing Form, issue #6). 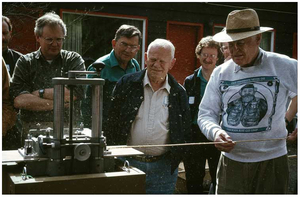 The tapered strips looked excellent, in fact it is amazing to get tapered strips with a comparatively simple machine like that Jack Byrd of Edmonds, WA, demonstrated his pressure glueing device, that works like a "Chinese finger cuff" (see Planing Form, issue #9). It uses a piece of polypropylene, hollow braided rope, the freshly glued rodsection is inserted into it and then the rope with the section in it is pulled tight and the strips being pressed together. An interesting concept that helps to keep the glued rod sections straight until the glue has set. Most attention had been attracted by the milling machine built by Richard Sherman of Huntington Beach, CA. Some time ago he bought a used Williams & Hussey W-7 Molder/Planer and completely modified it for milling split bamboo strips to a perfectly triangular cross section. The milling process works in two stages. During to first pass through the machine, the pith is milled off a prepared strip. Prepared means that the strip has been straightened and the nodes have been flattened. During the second pass the 60° angle is being milled. The cutters are located on the same shaft, the 60° angle is formed by two 30° side milling cutters, mounted side by side. The feed of the strips works automatically. The machine is powered by a 1 hp electric motor and V belt and its weight is about 120 lbs. With high precision strips made by this machine, it must be a joy to plane the final taper. Well done, Richard!